It seems that we have our very own (unsung) hero here in Carnarvon, someone who was part of one of the most notable events in British history. Not only did he take part in the Battle of Trafalgar, but he was a member of the crew of what is probably one of the most famous British warships in history. The Victory had a crew of 820 men, of which 57 were killed, so Griffith was one of a select band of men. position as it has been moved to 'tidy' the churchyard. Griffith Griffiths was baptised at Llanbeblig Parish Church on the 22nd. of June 1783, the son of Robert Griffith, a labourer, and Margaret his wife. He had two known siblings; brothers John, baptised 29th. of September, 1781, and Thomas, baptised 27th. of November, 1785. Sadly Thomas died on the 7th. 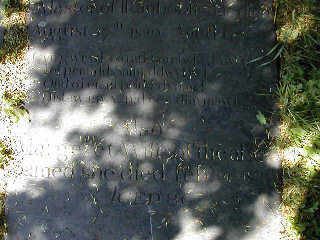 of July, 1786, and was buried at Llanbeblig on the 21st. of July. Robert had married Margaret Humphreys at Llanbeblig on the 20th. of June, 1777. 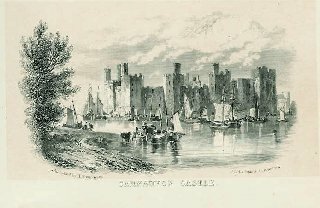 He was recorded as being of the Parish of Llanberis. 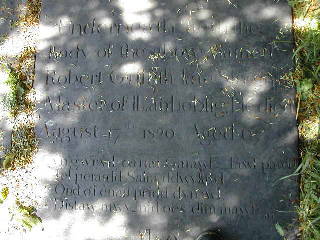 Robert Griffith was well-known in Carnarvon, going by the nickname of "Cantwr Salm", so called because he was the Singing Master at Llanbeblig Church. 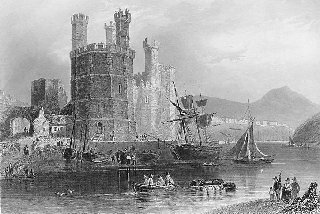 According to John Wynne in his book "Hanes Sir a Thref Caernarfon" (See Miscellaneous Section), Robert Griffith had worked his way up from being a humble labourer, and by the early years of the 19th. Century, had taken over Elizabeth James's Slate Loading business at Slate Quay in partnership with her son James. Later he went into partnership with another Robert Griffith, of Pool Street. Apart from the recording of his baptism, nothing further is known of Griffith's early life. He enlisted in the British Navy in either late 1799 or early 1800, when he was about seventeen years of age, and in total he served for eleven years. On the 11th. of February 1804 he was transferred from HMS Kent on to the Victory, where he remained for nearly two years. At this time he was recorded as being an Able Seaman. Notice is hereby given, that the remains of the late Vice-Admiral Lord Viscount NELSON will lie in state at Greenwich Hospital, on Sunday next, the 5th. instant, and on the two following days, between the hours of 9 in the morning and 4 in the afternoon. The Nobility, Clergy, and Gentry, who propose to attend, in their carriages, the Public Funeral Procession of the late Vice-Admiral Lord Viscount NELSON, from the Admiralty to St. Paul's Cathedral, on Thursday the 9th. instant, are requested to send their titles, names, and address, to the College of Arms, St. Bennett's-hill, St. Paul's, at or before 4 o'clock in the afternoon of Saturday next, the 4th. instant, or on any preceding day until that hour, in order that they may be ranked in the procession according to their several degrees, dignities, and qualities. The dress to be mourning, without weepers, and with mourning swords; Knights of the several Orders to wear their Collars; and the Clergy to be in the habits of their respective degrees. Such Officers of the Navy, as have no particular duties assigned to them in the solemnity, and wish to attend on the occasion out of respect to the deceased, are requested to send their names and address to the College of Arms, at or before 4 o'clock in the afternoon on Saturday next, the 4th. instant, or on any preceding day until that hour, in order that a sufficent number of carriages may be provided for their accommodation. They are requested also to appear, on the day of the Funeral, in their full uniform. It is recommended, that servants attending the carriages of the Nobility, Clergy, and Gentry, in the Procession, will be put into Mourning. Various designs have been submitted for the carriage, or open hearse, in which the body of Lord NELSON is to be carried. The design, which we understand has been approved of, has been imperfectly described in several publications. The hearse will be placed on four wheels, which will be partly concealed by the draperies. The body will be placed on an elevation of about ten feet from the ground, and the ends will be sculptured to represent the head and stern of Lord NELSON'S ship, the Victory, painted proper. At the stern, over the figure of Victory, will be the flag of a Vice-Admiral of the White. The cushion, with the coronet, will be placed upon the coffin, and the pall will be thrown back, so as to display a considerable portion of the ornaments, with the gold plate of inscription. From the body of the hearse will rise four columns, representing palm-trees, with the branches forming the capitals. These are to be painted dark green, relieved with silver. They will support a canopy of an antique fashion, something after the style, as has been mentioned, of an ancient sarcophagus, surmounted with pediments, and crowned with six large sable plumes of ostrich feathers. Under this will be a drapery of black velvet, bordered with a magnificent gold fringe. All those parts of the hearse that are not painted proper, will be covered with black velvet. On the frize of the canopy, there will be inscriptions lettered in gold. On one side, the motto of the Noble Viscount, "Palmam qui meruit ferat;" and on the other, "Hoste de victo requiecit." On the back and front, the names of "Nile" and "Trafalgar." On either side, underneath the coffin, will be hung three atchievements of Lord NELSON'S arms, being, we understand, the number allotted to his rank in the Peerage. Four mourners will sit at the corners of the coffin, who, it is supposed, will be four of his Lordship's Lieutenants. The horses will be appareled with black velvet housing, and led each by a groom in mourning. All possible pains have been taken, in this instance, by a reference to the cars used at the funerals of Sir PHILIP SYDNEY, Lord SANDWICH, and the DUKE of MARLBOROUGH, as well as those which were used at the last obsequies of distinguished personages on former occasions, that this part of the ceremony may lose nothing by a comparison with the funeral pomp of former times. It is said, that not fewer than four hundred coaches are expected to attend in the Procession, including the mourning-coaches, those of the persons of distinction, who will take a part in honour of the ceremony, and the train of equipages which will follow, most of which will have six horses. A suggestion, respecting the bringing up of the body to the portico of St. Paul's, was made, but which, we believe, will not be adopted. 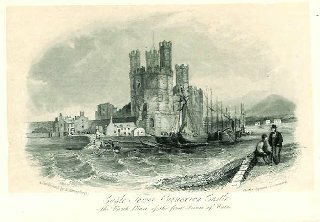 It was proposed to make a sloping platform, on a gentle decline, from the great West door into the centre of the circular court in the front of the Cathedral; the horses were to be taken off on the entrance of the hearse within the gates, when it was to be drawn by the sailors up the platform into the great Western Entrance. Besides the banners of Lord NELSON'S arms, a grand emblematical banner will be carried in the procession. It is understood that, in consequence of the recommendation from the Herald's College, a great number of the domestics of people of Quality will be habited in deep mourning: but it is not believed that this will extend to the servants of the ROYAL FAMILY and some of the chief Nobility, who will rather appear in their state liveries, with the emblems of mourning. Most of the Naval and Military Officers will be in close mourning, with their full uniform coats. The Heralds are to wear black cloaks, with their tabbards over them. Griffith and his fellow sailors then had a week ashore, before being transferred to HMS Ocean on the 16th. of January. The very next day Griffith was discharged from the Ocean to HMS Fame, where he was to spend the next five years. Even though he was probably considered a hero in Carnarvon when the news of his exploits eventually reached the town, life in the Navy was anything but pleasant, and it must have been hard going for a young man like Griffith. There must have been many a time when he felt anything but a hero, with only the promise of a healthy reward in the form of his Prize Money to look forward to. At the time it was the practice to pay the men a share of the proceeds from the sale of captured 'booty', although it did not always go according to plan. There had been a public outcry after Trafalgar, when, as a result of many of the Prizes being lost in the storms that followed the battle, Parliament had to step in, and were compelled to make a further award to the men. As a result Griffith received £4 12s 6d from the Parliamentary Award and £1 17s 8d Prize Money. His total award was the grand sum of £6 10s 2d., a quite substantial sum of money at the time. Brief periods of wealth aside, the call of home finally proved too much, and although it is not certain if his family and friends back home were ever aware of his actions, records show that Griffith deserted the service on the 1st. 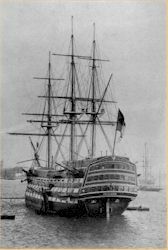 of April 1811, while on shore leave at Portsmouth. The records also suggest that up until this date he was making regular payments to a relative at Carnarvon. 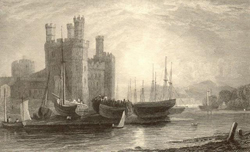 It is not known if he ever stood trial for his desertion, or indeed, exactly when he returned home, but what is certain is that he was back in Carnarvon by 1813. On the 30th. of June of that year Griffith married Ann Jones at Llanbeblig Parish Church. Although their first child was not born until two years later, they were blessed with a total of six known children: Ann in 1815; a second Ann in 1817 (who is not recorded in the Parish registers, but is commemorated on a gravestone at Llanbeblig, along with her mother and grandfather. She died on the 12th. of May, 1817, at the tender age of two weeks); Robert, 1818; another Robert in 1821; Thomas in 1822; and Griffith in 1824. In all the baptismal entries for his children, Griffith is variously described as a mariner or sailor, which seems to indicate that he continued to ply his trade during the intervening years. Sadly Ann died on the 2nd. of March, 1837, at the relatively young age of 51, and was buried at Llanbeblig on the 6th. of March. 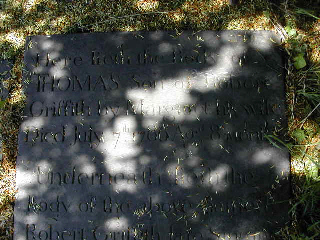 The memorial inscription on Ann Griffiths's headstone has been recorded by the Gwynedd Family History Society. 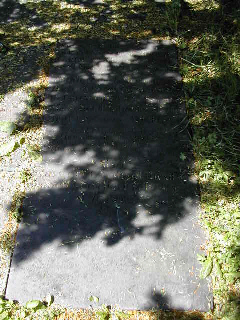 Sadly, however, a photograph has not been possible as the stone has not yet been located at Llanbeblig, where many of the stones near to the church have been moved to landscape the area. It is unclear whether there was any relationship between Griffith's family and the head of the household, Ellinor Parry, although the fact that she claimed to have been born outside the County tends to point to the negative. What is apparent, although not yet proven, is that thirteen year old Edward Edwards was the youngest son of Jane and her previous husband. Griffith was buried at Llanbeblig on the 17th. of November, and although there was hardly a word about his passing in the Carnarvon & Denbigh Herald, an old seadog with an unusual claim to fame would surely have had a large and memorable sendoff. Note: I am given to understand that there are only 14 known graves of Trafalgar veterans who served on the Victory. It is such a pity that, even though we know Griffith Griffiths was buried at Llanbeblig, there is no marker for his grave. Llanbeblig Monumental Inscriptions as recorded by G.F.H.S. Gareth Griffiths, for collating some of the above information, and perusing the Llanbeblig M.I.'s. Dr. Reg Davies of Welshmariners for details of Griffith's naval career and desertion. Pamela Ayshford for checking the Muster Books of HMS Ocean & HMS Fame, and clearing up some slight confusion over Griffith's vessels.